I'm educating myself by looking through the sale, and she's got flair! Clothing, bags, jewelry, iPhone cases, iPad sleeves, belts, wallets, and more are hundreds off the regular price. Shipping is only $5 to all 50 states. 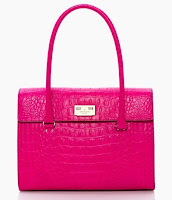 Click here to view the sale at Kate Spade. Note: You might have to subscribe to their newsletter club to view the sale. Membership has its privileges, I suppose.